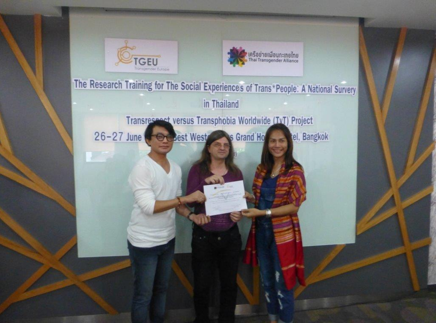 The TvT peer research training in Bangkok, Thailand was part of the implementation of the TvT survey on trans and gender variant people’s experiences with Transrespect and Transphobia in Thailand, which was already conducted in India, the Philippines, Serbia, Tonga, Turkey and Venezuela. The survey is done using a specifically developed peer research concept for trans and gender variant people, which combines data collection with empowerment of local communities. Therefore the training held in Bangkok, which seeks to turn activists into researchers for their own cause, to empower them and to enable them to empower the interviewees, was extremely important for the whole research. The training was held on June 26 and 27 2014. 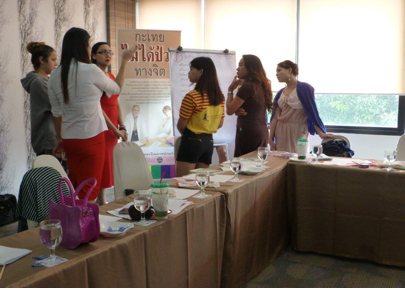 The training was a huge success due to the very professional organizing by TGEU’s partner organisation Thai TGA, and the strong commitment of the 18 Thai kathoey (trans women) participants, who travelled from 4 different provinces to Bangkok. Set in a professional conference venue, a very luxurious hotel, with professional acting staff using the right pronouns, the training received an extremely positive feedback. The participants emphasized the good spirit of the training, the empowerment, the learning of skills and the possibility of networking across regions. It was the first time that so many Thai kathoey from different regions participated in a trans-specific training. Thai TGA explained that they now have much better contacts and a better reach out to regions in which they missed contacts for their daily work. 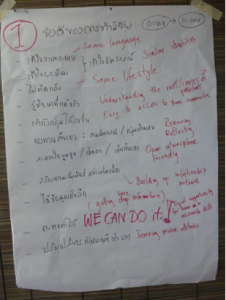 In the two days the participants learned about the TvT project, Thai TGA, global trans activism and peer research and were trained in how to do research interviews and how to empower local communities. At the end of the training the participants received certificates for a successful participation signed by the Thai TGA chair and TGEU’s Senior Researcher.